"Actress, dancer, singer," she says, smiling, as he chuckles. 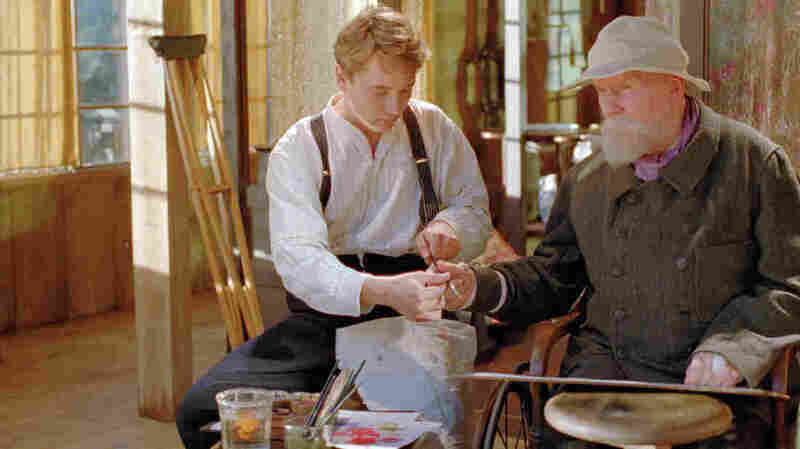 Hobbled by arthritis, Renoir spends his days in a wheelchair, hands so swollen he needs help just picking up a brush. Still, he can make canvases glow, and in Andree he finds inspiration — velvety skin that soaks up light; flaming red hair; firm, rounded flesh. "Titian," he says, "would have worshipped her." As she lounges naked on divans, in bed and in a field, or wades in a stream, draped in a fringed red gown, twirling a white parasol, the camera worships her too. The beautiful, boastful model Andree (Christa Theret) serves as a muse for both Renoir men. Andree, played by a poutily ravishing Christa Theret, is framed by director Gilles Bourdos in nature of such earthy abundance that the master's paintings sometimes overflow into the real world. In one shot, the camera glides from a close-up of Renoir's brush strokes, off to one side of the canvas, revealing the bathers he's painting — but not refocusing, so that the screen bursts with a kind of moving Impressionism. The director seems less concerned about filling the frame with incident — even after the artist's son, Jean Renoir (who will one day become the brilliant director of such classic films as Grand Illusion and Rules of the Game), comes home wounded from the war. With all that lush natural beauty, he's more or less obligated to fall in love with his father's muse — though there's an added degree of difficulty, given that Andree has not just that fiery red hair but a fiery temper to go with it. Happily, Jean can fire her imagination with shadowy images from a hand-cranked projector, flickering on a sheet. If you know she later starred in his first silent films, you'll have a little something extra to play with during the idle moments in Renoir. And there are plenty — but as the film drifts languorously from one gorgeous visual composition to the next, every frame its own work of art, you'll not object too strenuously.